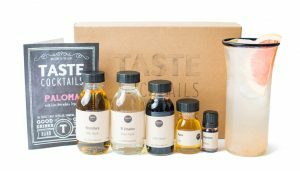 Since we first launched in February 2014, TASTE cocktails has produced 30 unique monthly cocktail kits, with spirits ranging from classic gins and whiskeys, all the way through to Mezcal and Cacahça. Some of our wonderful subscribers have stayed with us since month 1! Sadly, we haven’t manage to grow our enthusiastic but ultimately small group of cocktail lovers to a level that allows us to keep going as we are, so we’ve decided to make some changes to what we produce and how we offer it, to make sure we can keep helping people make great cocktails at home. 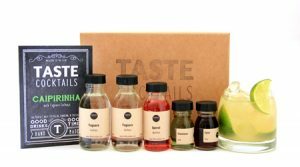 If you received our Caipirinha kit last month, with Yaguara Cachaça, you were lucky enough to receive our last ever monthly subscribers kit! This month, our current subscribers will be sent one of our previous boxes that they haven’t already received, and we will continue sending out boxes that each subscriber has not yet received until we run out, or they choose to end their subscription. In reality this will be much the same as how our subscription has run so far, but there is now a known end date in sight for each subscriber. If you’d prefer not to receive some of our older boxes (even though they will be new for you), you can cancel your subscription through your account. Our most popular kits will remain in our shop for sale. You’ll always be able to buy Espresso Martinis, Mojitos, Old Fashioned etc. as a gift for someone special, or a treat for yourself! We hope to occasionally add new kits to the range in the future as well, and if you’re on our mailing list you’ll be the first to know. 4- 3-month subscriptions, and gift vouchers will remain. One of our most successful products has been the 3-month subscription! With the permanent range, we can ensure we always have 3 gin products and 3 whisky products available, and ship them monthly over 3 months. As we add more to the range we can create new 3-kit combinations. Do you love a good G&T? We really do love the monthly subscription! So with that in mind, we created www.ILoveGin.com – the best way to discover your perfect G&T, tasting new gins, and new tonics/mixers every month. We launched the ILoveGin club as a separate company to TASTE cocktails while we tested the idea but we’re now happy to announce that it’s the latest member of the TASTE cocktails family. For £14/month you can join the club which includes a monthly G&T tasting box, great member-only discounts on full-sized bottles and extra tonics, exclusive discounts and invites to great gin events, and membership of one of the biggest and most enthusiastic communities of like-minded gin lovers online! Come and join us on ILoveGin.com, and especially on Facebook, for some great Ginspiration!